Unique desktop world globe shows focused strength. Zeus forces Atlas, a Titan, to repent for his sins against the gods of ancient Greece by forcing him to support the world on his shoulders. 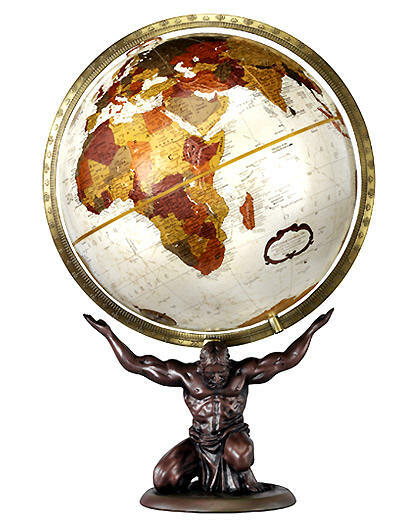 This detailed Bronze with patina finished resin replica accents the strength and grace by which Atlas accepts his challenge. The 12" bronze metallic map offers deep earth tone colors, full raised relief and a full metal die cast meridian with antique finish.